Vindictive? Moi? I guess so. Every time I hear this song I think back to my student years, when I had to deal with a few teachers who were always grinning when I talked with them, but when it came down to re-evaluating a grade I got which was too low (by all accounts) they wouldn't listen to reason. So this one is for Swante and Henk. 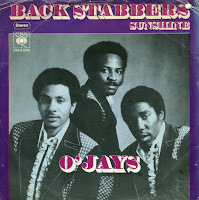 The O'Jays had a hit with this back in 1972, peaking at number 3 in the US Billboard Hot 100 singles chart, number 14 in the UK and number 11 in the Netherlands.